Like many American cities, Jacksonville—the largest city in Florida—faces some serious problems regarding unemployment, disinvestment, and concentrated generational poverty— and, like most cities, has only a limited set of resources available to tackle these problems. 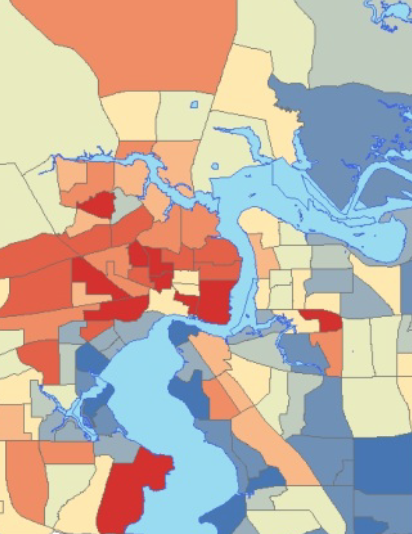 Are there strategies and models that can help Jacksonville build community wealth more effectively in the neighborhoods, like Northwest Jacksonville, that need this help most? This was the question on the mind of ICARE (the Interfaith Coalition for Action, Reconciliation, and Empowerment—a network of 38 local congregations and 30,000 residents) when they asked Mayor Alvin Brown to explore the possibilities for undertaking a concerted effort to address the economic issues facing the city. This initial request led to the report featured here, which was the result of a process that began with over 40 interviews with key community stakeholders conducted by The Democracy Collaborative at the end of 2013, and culminated with a citywide Community Wealth Building Rountable jointly organized by the City of Jacksonsville, ICARE, and The Democracy Collaborative on March 27th and 28th, 2014. Connecting civic and community leaders with national best practices, The Democracy Collaborative brought key partners from the five Community Wealth Building Initiatives we've helped spearhead—in Cleveland; Amarillo, Texas; Pittsburgh; Atlanta; and Washington, D.C.—to the Roundtable to share the lessons learned in those cities. The video of the roundtable featured here highlights the remarks of those invited guests, as well as the contributions of some of Jacksonville's passionate local advocates for a renewed approach to comprehensive community economic development. 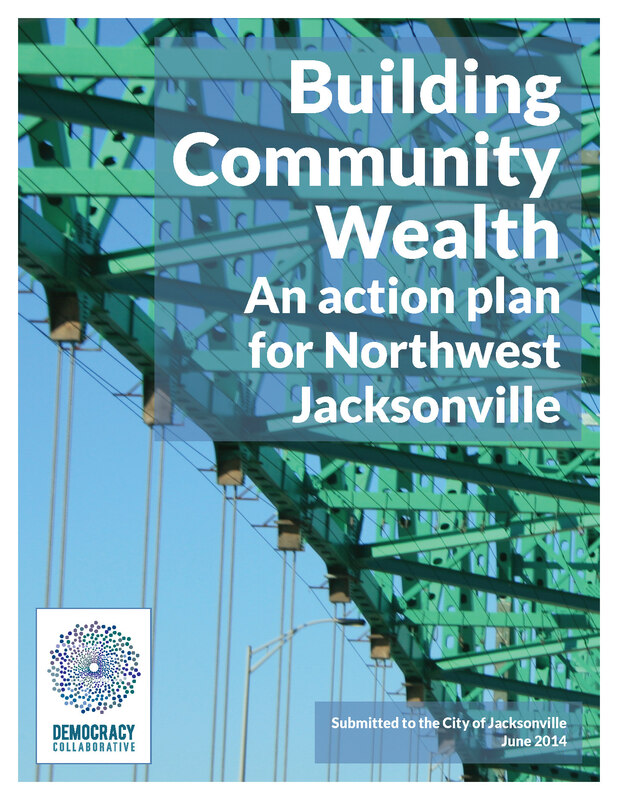 Learn more about the continuing work of the Jacksonville Community Wealth Building Initiative on the City of Jacksonville's website. The crowd at Mayor Alvin Brown’s first Business Builder conference in early 2012 still bore the wounds of the Great Recession, casting a sense of guarded optimism among the budding entrepreneurs who turned out for the event. Florida Times-Union: "Leaders working toward 'brighter day' for Northwest Jacksonville's economy"
"A group of Jacksonville leaders trekked to snowy Cleveland in February to check out an economic initiative they hope to use as a model for the struggling northwest part of the city. 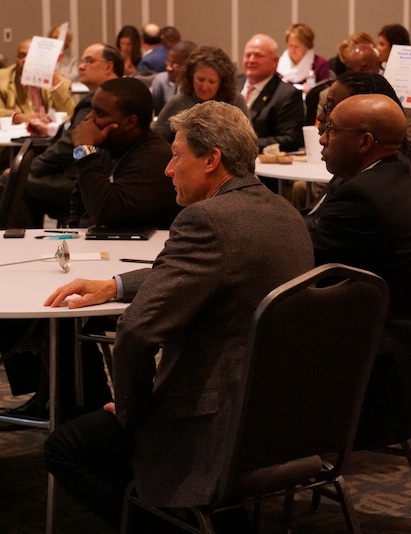 The people behind that Cleveland initiative, a University of Maryland-based nonprofit called The Democracy Collaborative, held a roundtable in Jacksonville on Thursday and Friday to show a larger leadership group what is working in other cities. Local leaders collectively said they intend to follow through for Northwest Jacksonville, where unemployment is more than double that of the citywide rate." Mayor Alvin Brown today announced the members of a newly-formed task force to guide a Community Wealth Building Initiative that will focus on new strategies to create jobs and business opportunities in Northwest Jacksonville.